The snow was everywhere. It covered the valley like a shroud, hiding the wreckage of a hundred spaceships, their outlines as blurred as my memories of battle. If not for GPS, I wouldn’t have known that I stood by the resting place of the Falling Dream. But somewhere under the snow was the ship on which I had almost died. “Is this her?” Calder asked. I looked at the towering heap of snow that hid a conning tower, the white curve that concealed a bow, the indentations that might be shuttle bays. With thickly gloved fingers, I pulled out a tablet and fumbled with the screen. My mechanical hand was more dexterous, but I still favoured the real one. The therapist said I always would. An image of the Falling Dream appeared, showing her at the height of her glory. I compared the outline with the one in front of me. It could have been a match for my former home, or for any of a dozen other ships abandoned here. I thrust the tablet back into my bag and stomped uphill, along the sloped deck. In places, I sank up to my waist in the snow, but I kept going. I needed some souvenir to remind me of what I had survived, some compensation for my lost hand. I had to be sure it came from my ship, and for that I needed a better view. Calder cursed, but she followed. That was why I’d trusted her to come with me. She always had my back, even when the darkness descended and I couldn’t care about anyone but myself. The higher I got, the harder the wind blew. There was nothing left to shelter me. Snow plastered my goggles, forcing me to stop every few steps and wipe them clear. It stuck to the front of my body, forming a thick crust that fell away in chunks, only to be replaced on the next gust. I was almost at the top when a fresh blast of wind crossed the edge of the wreck. It flung me from my feet. I hurtled back, crashing awkwardly into the snow. The breath was knocked out of my body and black spots danced across my vision as I went tumbling downhill, spreading my arms and legs in a desperate attempt to stop my descent. At last I skidded to a halt, bruised and winded, half-buried in a white drift. Calder slid down the slope to me, using her backpack as a sledge. Even with her face wrapped in goggles and scarf, I could sense her concern, that stiffness of body that always gave her away. I got to my feet and looked upslope. Now I knew what I was looking for, I could see fierce winds buffeting every raised point in the valley. There was no way I could secure myself up there long enough to view the shape of the wreck, if that was even possible. I punched the snow. It was too soft, too yielding to provide any satisfaction. Calder probably didn’t realise she’d taken a step back, but the movement made me stop and take a deep breath. There had to be a way to do this. I looked down. I was in the indentation of one of the shuttle bays. There would be markings around its mouth. I could use them to confirm that this was the Falling Dream. Starting where I had fallen, I dug deeper into the snow. My mechanical hand was faster and stronger, but I used the one of flesh and blood too, frantically scooping up heaps of snow and flinging it aside. Soon I was a foot down, then two, three, digging myself deeper into the featureless, freezing landscape. I ignored her. She didn’t understand. She hadn’t been there. Hadn’t seen her own hand vanish into a fine red mist. Hadn’t heard the screams of the dying. She hadn’t lost her ship and everything it represented. The collapse came suddenly. Snow fell in from all sides, knocking me to the ground, burying me beneath its weight. The world went dark, just like it had in the battle, and I screamed for all I was worth. I tried to stand, but I was too deeply buried. Just drawing my arm in to me was a struggle. My breath came in shallow gasps. My lips went from numb to tingling and then I didn’t feel them any more. Something brushed my shoulder. That single movement was the finest thing I had ever felt. I forced my arm around and took Calder’s hand where she had plunged it through the snow. She heaved and I pushed. The snow became lighter as she dragged me up, and I scrambled frantically to get clear, to escape my icy tomb. At last, I lay panting in the snow beside her. I looked at my mechanical hand. The glove had come off and the joints had frozen up. At least that hadn’t been my real fingers. “What now?” Calder asked wearily. “Now we go home,” I said, and it was as if I had left some great weight behind me in the hole. 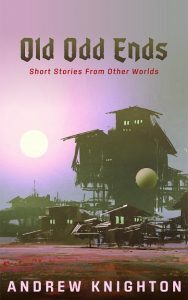 My new e-book, Old Odd Ends, is out today! 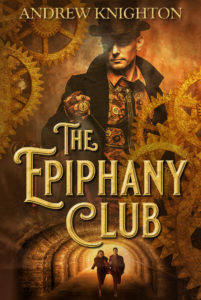 It’s a collection of over fifty flash stories I wrote last year, featuring a magic-wielding gambler, a steampunk noir detective, and much more. It’s only $2.99, so if you’d like to read more of my stories and help me keep providing them every week, then you can go buy a copy now. When you’ve read the stories – or if you already read them here last year – then please consider leaving a review wherever you buy your e-books. Reviews are great for helping writers reach new readers. And if you’d like to receive a free e-book plus short stories straight to your inbox every week, then please sign up for my mailing list.